Three versions of the most famous character in the history of movies: While in sheer story-telling terms the preceding From Russia With Love is better written and directed, Goldfinger is the definitive adventure of British secret agent 007 for one reason that’s not the car, not the blonde swathed in fatally gold paint, not the Asian villain with a lethal hat, nor even the spectacular Shirley Bassey theme. Rather it’s the rough-around-the-edges Scot whose casting so appalled Fleming, and who finally made the role his after two largely successful but slightly awkward dress rehearsals, minting as he did the third time out an unsettling combination of cruelty and élan. Sean Connery was succeeded by a procession of pretenders, of course, one of whom, Roger Moore, not only played the character more than anyone but in fact was Fleming’s original choice, which shows you how much novelists know. But a viewer should never be plagued by the suspicion that even he can beat up James Bond. Pierce Brosnan seemed the worst choice yet when cast in GoldenEye, but that was only if you hadn’t watched him as a cold-blooded IRS killer in 1980’s The Long Good Friday. With the welcome dial-back of gadgets and techy gimmicks that the Bond producers institute every decade or so, not to mention underrated Bond girl/villainess for the ages Famke Jannsen (later in the X-Men pictures), Brosnan made GoldenEye one of the most irresistible Bonds. Nearly as counter-intuitive in his casting as was Matt Damon as that American agent with the memory problems (Essential Movie Library #82), blond and thuggish Daniel Craig would have shocked Fleming most of all, which may be why his 007, still counting his way up the digits when introduced in 2006’s Casino Royale, is the most indelible since Connery. 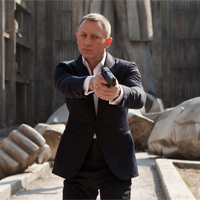 With Craig, Bond wasn’t rebooted but replaced by a new model altogether and, like Connery, Craig finally owned the role for good in his third outing, the dazzling Skyfall with its psychedelic Shanghai, Javier Bardem’s delicious turn as a rogue spy, and Judi Dench’s shocking swansong as M.